Alfred's Kid's Piano Course is a fun method that teaches you to play songs on the piano right away. This complete edition combines levels 1 and 2 with the activity pages of the Notespeller, and includes online access to recordings of each song and exercise so you always know how the music should sound. Each lesson on every colorful page is explained in plain language that's easy to understand; plus, you get to learn from three irresistible piano experts---a clever, classical dog, one cool jazz cat, and a friendly alligator who loves the blues. They draw attention to what's important on each page and help you learn by making music fun! Parents can be effective guides to help you through this course, even if they've never had any musical training themselves. Get ready to take your first and best step toward a lifetime of musical enjoyment! 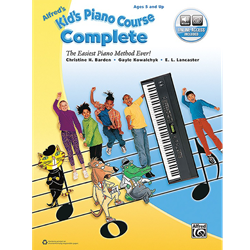 Alfred's Kid's Piano Course is a fun method that teaches you to play songs on the piano right away. This complete edition combines levels 1 and 2 with the activity pages of the Notespeller, and includes online access to recordings of each song and exercise so you always know how the music should sound. Each lesson on every colorful page is explained in plain language that's easy to understand; plus, you get to learn from three irresistible piano experts---a clever, classical dog, one cool jazz cat, and a friendly alligator who loves the blues. They draw attention to what's important on each page and help you learn by making music fun! Parents can be effective guides to help you through this course, even if they've never had any musical training themselves. Get ready to take your first and best step toward a lifetime of musical enjoyment! Alfred's Kid's Piano Course is a fun method that teaches you to play songs on the piano right away. This complete edition combines levels 1 and 2 with the activity pages of the Notespeller, and includes online access to recordings of each song and exercise so you always know how the music should sound. Each lesson on every colorful page is explained in plain language that's easy to understand; plus, you get to learn from three irresistible piano experts---a clever, classical dog, one cool jazz cat, and a friendly alligator who loves the blues. They draw attention to what's important on each page and help you learn by making music fun! Parents can be effective guides to help you through this course, even if they've never had any musical training themselves. Get ready to take your first and best step toward a lifetime of musical enjoyment!